It doesn’t have to take a lot to turn a boring, stale room into a dramatic, inviting space. It’s time to spruce up your home for spring and summer. But don’t waste time (or money) on anything that doesn’t pay you and your house back. Designer Carolyn Kinder offers seven ideas guaranteed to make a difference in your home. Update the front door: If you’re like many homeowners, the back or side doors of your home get the most use, but the front door is your home’s public face and it often suffers from neglect. “Often people don’t think about the front entry as much, but sprucing up the landscaping, resurfacing a walkway and/or replacing a door which may not be very expensive can really make a difference,” says Carolyn Kinder. Add a table or other surface to your home’s main entry: Most entries or mudrooms have plenty of coat storage, but what they lack is a table to unload. “You can’t take your coat off until you put down your things, so your home can really benefit from a place to put things down” says Kinder. Upgrade the task lighting: Statistics now claim that Americans spend more time on the Internet than they do watching TV, which means that well-lit, attractive places to work are paramount. Choose a task light that doesn’t invade the space around the room, suggests Kinder, to add comfort, style, and the right illumination for the task at hand. Include beautiful accessories in a work room: Just because it’s the space in which you pay the bills or fold the laundry doesn’t mean the work room has to be boring and utilitarian. Dress up this space and your home will notice the difference. Perhaps try covered bulletin boards, comfortable chairs and pretty clocks. It will make a difference in how you and others perceive your home, says Kinder. Change out textiles or accessories: The word “comfort” is used a lot these days to describe home updates, and that’s because people are spending more time in their homes. New textiles such as pillows and throw blankets or a small rug can change the look of a space without a big dollar investment. Try a few simple plants, a small sculpture or other piece of artwork. Refresh a seating area: A seating upgrade can really help visual perception and physical experience of high-traffic areas, such as the kitchen, den and dining room. “It’s fun to be a part of what happens in these areas, and if you can enhance the quality of the experience, that room becomes more comfortable,” says Kinder. Summertime brings fun in the sun, longer daylight hours, and one caveat: hotter temperatures means running the air conditioner and increased energy bills. Here are three easy solutions that budget-conscious households can use to immediately save money. Read Your Labels: Before you purchase another light bulb, lighting fixture or ceiling fan, look for the Energy Star® label. Those products have undergone rigorous testing and meet the government’s strictest new guidelines for energy efficiency. 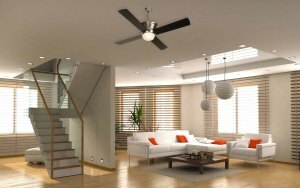 Be a Fan of Ceiling Fans: In summer, it’s possible to turn your thermostat to 78 degrees and if you’re using a ceiling fan, the comfort level would be the same as if the thermostat were at 72. Obviously, you could turn off the AC and only use the fan. Just remember to turn off fans in rooms that aren’t occupied to avoid wasting energy. Choose the Right Light Source: Lighting accounts for approximately 20 percent of a home’s energy cost, so changing the most frequently used lights to more efficient fluorescent versions can make a tremendous difference. The key is to consider the hours of use – the savings are greater and bulb life is longer when fluorescent lighting remains on for longer periods of time. A CFL produces about four times the light for the same amount of energy as an incandescent. Then there’s the matter of color. CFLs are available in three colors, and are often described as warm, neutral, and cool. The warm color will usually be the closest to incandescent. By far the easiest way to find the right CFL for your home is to go to an ALA member lighting showroom. n this economy, few people one can afford to knock down walls or put an addition on their homes. However, for considerably less money, any room can appear larger and look better with one or two strategically placed sconces. Sconces are lighting fixtures that are mounted to a wall and provide subtle illumination and a warm ambiance. They bring human scale to a room and finish the space. Sconces are attractive and effective in many places, including dark corners, upstairs hallways, media rooms, bedrooms, dining rooms, living rooms and bathrooms.